TORONTO — Ontario is the first province out of the gate with a detailed plan to sell and distribute recreational marijuana when Ottawa legalizes it next summer. The Liberal government announced Friday that it will sell marijuana in as many as 150 dedicated stores run by the province’s liquor control board. Those looking to purchase marijuana when it becomes legal across the country will be subject to the same age and usage restrictions currently in place for alcohol, said Attorney General Yasir Naqvi. Asked about expected revenues, Sousa could provide no estimates, saying the market conditions and federal tax levels will impact the bottom line and are unclear. 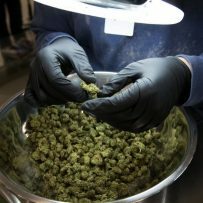 The federal government has pledged to work with provinces and commit resources to pot-related needs like public security, policing and educational campaigns.